Olde Mill Creek community is sold out and is not in active development by builder. If you are interested in Olde Mill Creek or similar new home communities, contact us today! Our agents are very familiar with new and newer construction in Suffolk, and can identify resale opportunities in Olde Mill Creek, as well as builder inventory available in nearby or similar communities in Suffolk. To view 21 more pictures, interactive maps and the full, detailed description of the Olde Mill Creek community, please Login. 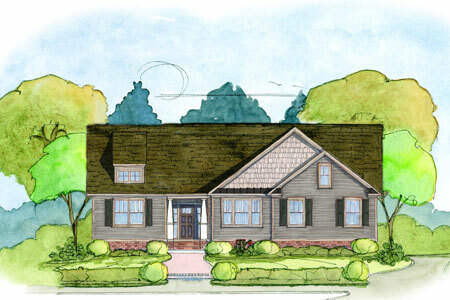 Afraid you won’t find quality new construction in the Hampton Roads real estate market? Think again! Every new home in Olde Mill Creek is built to please even the choosiest of buyers. This Suffolk community is located far enough away from the metro Virginia Beach area to give homeowners the rest they need, but close enough so everything fun is within reach. Virginia military members can access bases like Coast Guard Base Portsmouth, Norfolk Naval Shipyard and Naval Medical Center Portsmouth. There are ranch and two-story houses in this new construction neighborhood. Each new home here may come with ceramic tile flooring, ceiling fans, hardwood flooring, natural gas heating, attic, eat-in kitchen, finished room over garage, first floor master suite, loft, two-car garage with openers, sunroom, front porch, security system, crawl space, kitchen pantry, laundry room, patio, back deck and more. It’s not every real estate development in Hampton Roads that offers such high-end features that Olde Mill Creek does. This development is not far from one of the greatest natural attractions in southeast Virginia- the Great Dismal Swamp National Wildlife Refuge. Area residents can enjoy boating, hunting, fishing and more in this pristine park. Golfers can take advantage of Suffolk Golf Course, Nansemond River Golf Club and Sleepy Hole Golf Course. Take in concerts and attend seasonal events down at Constant’s Wharf Park and Marina, located along the Nansemond River. Olde Mill Creek is the real estate development offering premier new construction houses; come see which one could be your new home. Send me more information about communities similar to Olde Mill Creek. Our agents gladly offer FREE property tours of Olde Mill Creek, Suffolk and homebuyer consultations to all serious buyers.